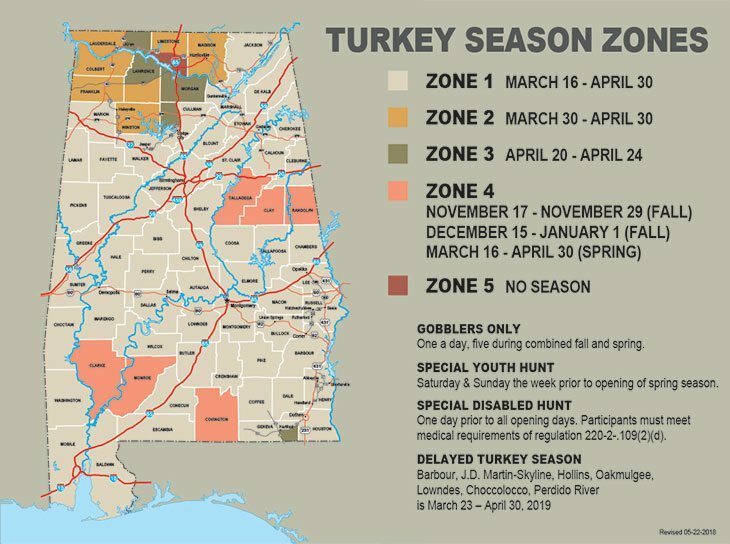 Where to Hunt in Alabama? * There might be slight differences in date ranges and types of the game due to different zones. For more information about the zones please refer to this image below. *North zone – All other counties except the ones listed above. **South zone – Barbour, Covington, Dale, Geneva, Houston, Mobile counties, Henry, Escambia, Coffee and Baldwin. Residents of 65 years of age or over must have a driver’s license or proof of permanent residence and age. In Alabama, it’s possible to purchase an appropriate license at the age of 16 that is for residents and non-residents as well. Hunting during the night is possible, but using any kind of night vision equipment is prohibited by General Prohibitions in Alabama. Also, any light source that is capable of casting a beam of light which aids you in aiming during the night is not permitted. The Division of Wildlife and Freshwater Fisheries maintains 35 Wildlife Management Areas (WMAs) across Alabama. These WMAs range in size from 400 acres to 91,263 acres. Freshwater Fisheries and Division of Wildlife offers Special Opportunity Areas as properties of a new format of hunting for the public. Even though they are usually smaller than the Wildlife Management Areas, these are perfect for a limited quota hunting format to improve the quality of the hunt. The trails here were developed by the Alabama Department of Conservation and Natural Resources. Registration isn’t required for these shooting and fishing sites. However, all potential users must have a proper license and must respect the regulations. This includes thousands of acres of forests which are outside of the Alabama WMA system. The forests such as Conecuh National Forest, Tuskegee National Forest, Talladega National Forest and Bankhead National Forest are within the area owned by U.S. Forest Service and suitable for big game hunting. 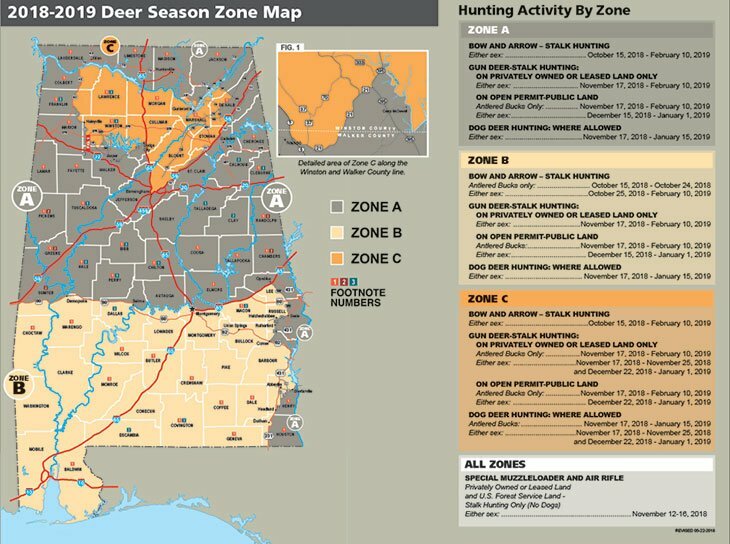 By the various rivers of Alabama State, there are several tracts of land where public hunting is allowed by U.S. Army Corps of Engineers. Since these properties are small, their use is more restricted regarding regulations. A free permit must be acquired from an official US Corps of Engineers office before hunting on any of these properties.